Express your individual style by adding a "wink" to your wardrobe or room with these beautiful blooms! With inspiring techniques for the novice to more advanced creative enthusiasts. 25 quick and easy projects to wear, decorate and share! 50 fabric variations to spark creativity! Pub: 9/1/2012. 88 Full-color pages. This video will provide shop owners with information on how to promote, sell and marketing Indygo Junction's Fabric Flowers to increase sales & grow your business. Inspiring projects combined with innovative classes and paired with just the right supplies will make happy Customers & happy retailers! Indygo Junction's Fabric Flowers can be your key to successful events & classes. The 25 flower projects in this book can be presented for classes in an endless variety of ways from a "Flower of the Month" (3 or 6 month offering) to a one day class on single or multiple flowers. Topics can range from seasonal flowers (ex. poinsettia for Christmas) or can be organized by technique (techniques include needle felting, recycle/repurpose, Clover tools, sewing machine methods, and hand & machine embroidery & beading). 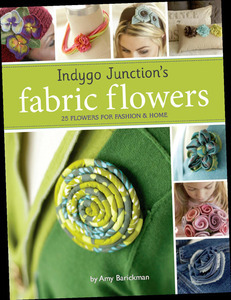 Visit http://www.indygojunction.com/PDF/fab... to download a PDF of class & event ideas for promoting Fabric Flowers. Visit our website at http://www.indygojunction.com/book/al... for more information on this title.